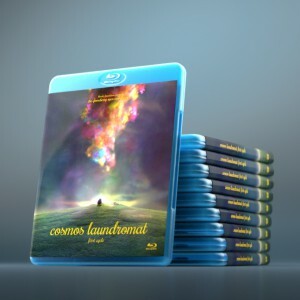 It’s June, meaning we’re in the final stretch of the Cosmos Laundromat production. In the weekly video below you’ll see more final animations, more renders, and new art…and, of course, plenty hair sims. In the highlights you’ll find previews of and links to even more material, such as two alternative endings only available on the Blender Cloud. Beorn has now animated all six shots of the flock surrounding Victor, which you will find in his weekly Cloud folder. In Beorn’s folder you’ll also find a before and after of the sequence where Franck looks back at the rope (which is now one shot shorter) plus his ongoing attempt to make the rope work properly in the scene where Franck pushes the branch (pictured). In addition to some more small tweaks to other animations, Hjalti has been working on the animations of Franck inside the storm. You’ll find both in 11 separate videos in his weekly Cloud folder. In addition to some final corrections to the sequence where Franck learns about his timer (in her weekly Cloud folder), Sarah began working on this new shot where Franck checks out said timer. Here you can see it go through three versions, from blocking to splining. She will continue her work on this shot this week. Sarah has also been doing a little more sim work, focusing this week on Victor in the shot pictured above. Of course the video version you’ll find in her weekly Cloud folder. Hjalti’s also been getting in on the Victor simming action. See his work on five different shots in his folder for the week. Manu has been pushing forward with more test renders, including this fresh look inside the laundromat. Find all the videos on his weekly Cloud folder. Mathieu has also been doing some lighting tests for the tornado scene, which should be dark and dramatic but with a bit of color reflected from the storm. Check out his weekly Cloud folder for more images. Pablo spent much of the week prepping shots and sending them to Qarnot for rendering. In his weekly Cloud folder you’ll find three final-quality shots – Franck hanging, the island from afar, and this shot – which took between 1.5 and 12 hours per frame to render. You’ll also find an updated hair sim test in this folder as well. Andy has made a new set – with wind, grass, and randomization – that will work with all the flock shots Beorn has been working on. See 18:12 in the weekly video for a peek. Then check out Andy’s weekly Cloud folder for the animation above plus more grass sim tests to see this set in action. This week Andy would like to add more randomization. Andy has now created low-res renders for all six tornado shots, which you can see in the next version of the full pilot. Part of this included setting up a shader for the inside of the tornado (using Lukas’s particle-swirl trick), which you can see here. Mathieu made this quick render of the benchmark image with new lighting for the splash screen, but will re-render it. Manu has pimped Victor’s watch, which now has a cosmic background and a detailed render. Find the full-res version on the Cloud. This week, Lukas has been testing OpenVDB (an initiative of Blender Developer Kévin Dietrich) for possible use in Project Gooseberry to help keep down the project’s huge cache sizes. See Lukas’s explanation at 5:44 in the weekly video, and then head to his Cloud folder for the week to get a closer look at these files and notes yourself. Antonis debuted the Image Sequence, a new option that allows you to import an entire sequence of images as a single file, which also makes it much easier to import a whole chain of frames into the Sequencer. See his demo at 9:40 in the weekly video. More bug-fixing for next week. Francesco is deep into Flamenco, working toward one goal: RENDER EVERYTHING. He’s also working on a new rendering manager that should allow the crew to send more stuff to the farm for previews (including OpenGL previews) with less hassle (and less caching issues). Francesco breaks down the challenges and solutions at 21:30 in the weekly video. You can also see where the ATTRACT pipeline management software stands at 23:04. Sergey is back in Amsterdam! He was too busy getting immediately to work to appear in the weekly livecast, but look for him next week. In Mathieu’s folder on the Cloud this week you’ll find two alternate endings for the pilot: a shorter version and a longer version that returns to the jungle for a quick look at Tara. Which, if either, will be used? Stay tuned in the coming weeks! The renders are looking fantastic from last week, and the edits (both) are coming together nicely. I am partial to the longer edit, but I know that is more work… It might be nice to even give a close pan up Tara’s legs cutting before they meet the body, then a close cropped shot of her gaze towards Frank, literally just framing one of her eyes. Or maybe just the close up of her eyes, maybe that is enough. Would give a little more intrigue towards her (and those crazy interesting eyes) and then give you a match shot of Franks reflection to cut back to the shot of Frank in awe you currently have. Just some food for thought. Oh, and should I be concerned if my name’s not in the credits right now (in Mathieu’s edits on the cloud)? Or are they just placeholders for now? I hardly think this is a concern with anyone over there right now, but I just want to make sure that I can be at all associated with this (soon to be) masterpiece. Just checking in case it is an error and there are other’s like myself who might be missing. I would normally just assume they are all placeholders (since it ends so early in the alphabet), but since my name starts with a B and those are in there right now, I thought I should ask anyhow. Thanks! I remember reading somewhere – about a former editing though, not this one – the credits were placeholders. Don’t worry for the credits, it’s the one from TOS :) it’s a placeholder. Thanks for the quick response, I had assumed they were placeholders, but like I said, just wanted to be safe. Can’t wait for Friday’s weekly! Great show love to see the commits and renders seems to be the best quality open movie chapter even made. Go for it and enjoy the last couple weeks. I just watched the new edit and I enjoyed it so much. The storytelling, the visuals, the whole design, the beautiful renders and animations – I don’t even know what words I should use to describe what I am thinking – but it’s just so professional and great looking. 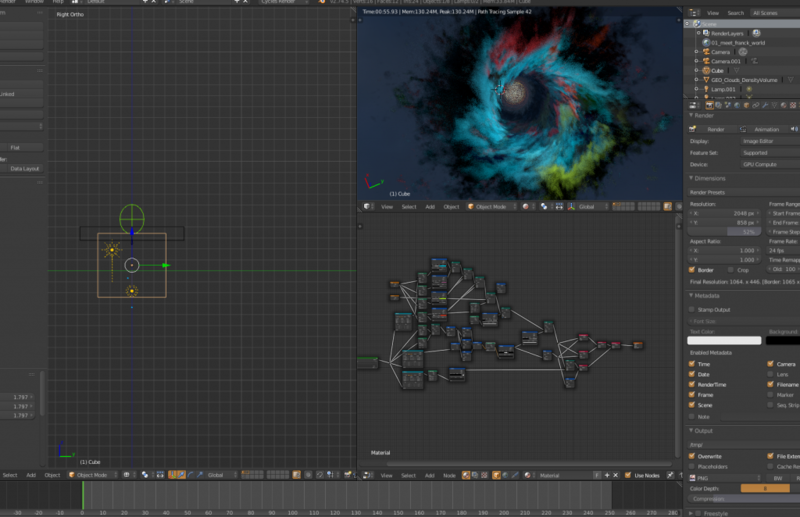 It’s a whole new fresh look and a new league for blender and also the blender institute and directions its taking. It’s great to be part of it (at least supporting you) and see it develop. You are all amazing people & making history.